Rusty metal is a very interesting way to print on paper and fabric. 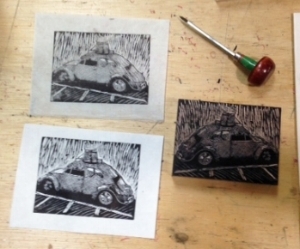 Learn how to create rich, earthy images through contact printing with rusty objects. This workshop will appeal to your inner artist and scientist by introducing the simple formulas and experimental processes for a unique mark-making experience that works beautifully on both paper and textiles. Lauri Jones received her BFA in Graphic Design from Rhode Island School of design in 1990. She spent most of her design career creating TV network identities, promotional animations, and main-titles for both domestic and international clients. In 2009, she earned her MAT (Masters of Fine Arts in Teaching) from the Savannah College of Art and Design. Since then, in addition to sharing her passion for art with young people, Lauri has reconnected with two of her first loves: bookmaking and printmaking. She creates works on paper, artist's books and textiles. Lauri’s rust prints are the result of her on-going conversation with materials and are a quiet celebration of natural decay and renewal. Paying with credit card: Use the PayPal button below the class description to pay with a credit card. Be sure to select the proper payment regarding membership status. You do not need a PayPal account. Using a Gift Card: If using a gift certificate to register for a workshop, contact Kathy Garrou to handle the registration. Contact Kathy Garrou, Executive Director for more information or with any questions. Tom "the evil head" Huck was in the studio! It was a chance to share a beer and hear first hand about his inspirations, prints, and Evil Prints press. Participants carved then pulled their own print while talking with the artist in the informal and creative setting of the Atlanta Printmakers Studio. Tom Huck of Evil Prints Press: Huck is best known for creating large-scale woodcuts acting as both satirical narratives and social criticism. "My work deals with personal observations about the experiences of living in a small town in southeast Missouri. The often Strange and Humorous occurrences, places, and people in these towns offer a never-ending source of inspiration for my prints. I call this work 'rural satire.'" 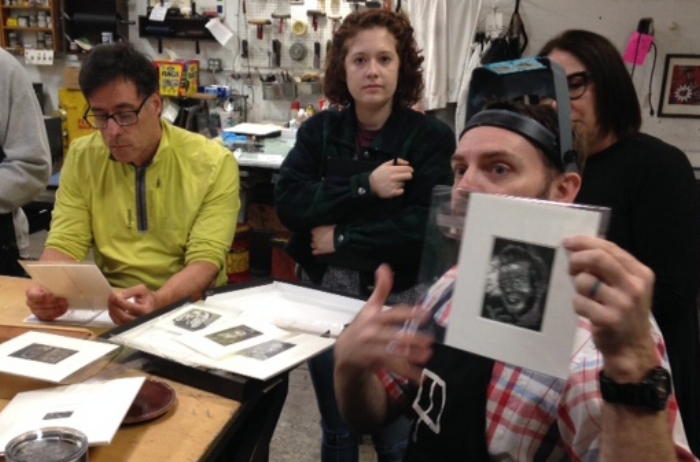 These workshops were arranged in conjunction with Emory’s exhibition Rival Cuts: Process and Technique in Prints by Tom Hück & Albrecht Dürer. Renowned printmaker Tom Hück will be in residence at Emory from Friday, February 15 through Saturday, February 23, 2019. Thanks to the Schwartz Center Artist-in-Residency program and the Andrew W. Mellon Foundation, Hück and members of his Evil Prints crew will conduct a number of public programs and teach in several Emory classes during the week-long residency. Was a pleasure having Katy back in Atlanta for the workshop! Participants learned about traditional paper making while exploring more modern paper making techniques with color, surface design, texture, and composition while creating sheets of handmade paper from recycled and natural plant fibers. Sheets of paper were formed with a variety of fibers as well as the creation of “wet on wet collages” that can include mementos from home. Katy Dement - Over the past 30 years Katy has created works in a variety of mediums for both private and corporate collections. She has recently moved to Pennsylvania and continues her studies in the fiber arts. 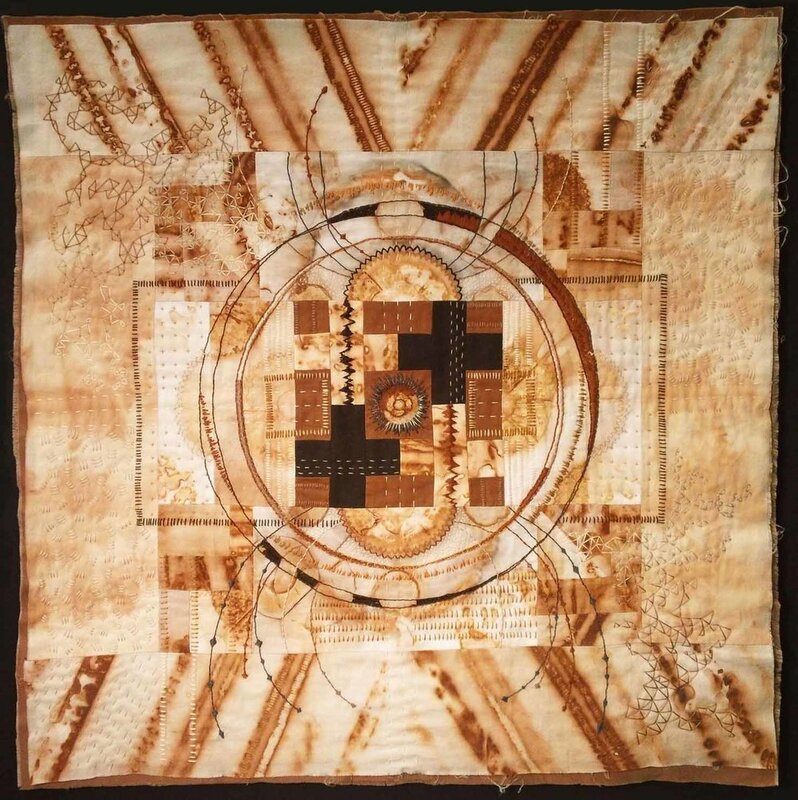 Her fascination with things from the past led to work in collage and paper making. Her most recent work focuses on lighting. With the addition of beeswax as a coating for the paper and the element of light, her new pieces are illuminating. Dement is self taught - living as a maker of papers for 30 years, so experiences will be different from any other paper making class you have taken. Thanks Chris for showing students a nontradional way of printing on the Vandercook! Chris Fritton is the former Studio Director of the Western New York Book Arts Center. A poet, printer, and fine artist, Fritton has over a decade of experience writing, printing, and making his own books, in addition to collaborative efforts with other authors and artists. He is most widely know for his project The Itinerant Printer, where he visited over 130 letterpress print shops throughout 2015-2017. The project is about reviving that sense of adventure in printing, along with the analog sharing of information. It’s about going out into the world, seeking work based on your skill set, making something with your hands, and delivering that object to someone. It’s about an exchange of ideas, of techniques, of information, of style, and of the consummation of all those things: prints. Fritton's two years traveling throughout America resulted in a coffee table book that features photos all of the prints, printshops, and people from his journey. Thanks Jessica White for instructing a very enthusiastic group of students in making crankies! Crankies are a part of a rich history in visual storytelling through scrolls, or moving panoramas. In the Appalachian region, larger crankies, often candlelit from behind, have been used by traveling musicians who scroll through images that depict the ballads as they sing, almost like a hand-made movie. Thanks Terri for exploring the various ways to make cyanotypes with workshop participants! 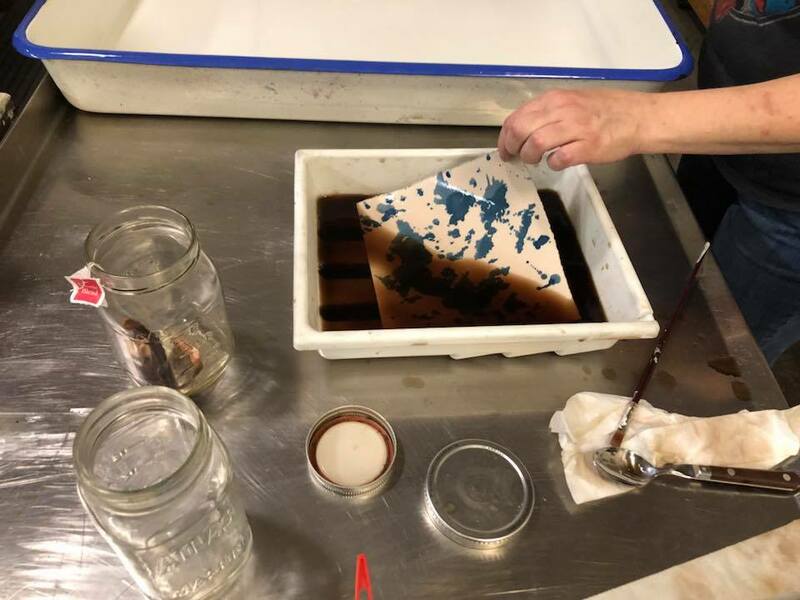 The cyanotype (blue print) was one of the first photographic printing processes invented and will be explored in various ways during this one-day workshop. The instructor will provide paper already prepared, which will be exposed in the sun and rinsed in water. Terri Dilling is an Atlanta-based painter and printmaker, and she's an active APS Board Member. Terri’s primary printmaking mediums are monotype, screenprint and cyanotype. She received a BA from Indiana University, a BFA Georgia State University, and has also studied visual arts in England, Spain, and Italy. Travels abroad have been very influential on her work which explores the beauty and complexity of the natural world with a focus on its structures, patterns and cycles. Terri has received numerous grants and awards, and her work is collections around the world. Many thanks to Todd Anderson and his grad students Mandy Ferguson and Allison Johnson for a wonderful workshop! Todd Anderson was born in Rochester, Minnesota. He received his BFA from the University of Wisconsin-Madison and his MFA from the University of New Mexico. Anderson worked in the collaborative printmaking field where he earned the title of Master Printer. For the last decade he has worked as a university professor. Anderson resides in South Carolina where he maintains an active studio while serving as the director of printmaking at Clemson University. His work has been widely exhibited at ~100 unique venues nationally and internationally. His artwork has been collected at the highest levels including the Jordan Schnitzer Family Foundation, the Davis Museum at Wellseley College, Yale University, U.S. Library of Congress and the Metropolitan Museum of Art. Anderson is represented by Kai Lin Art, Atlanta. His most recent body of collaborative work is currently on display at the Metropolitan Museum of Art through February 5th, 2018. Katrina Andry received an MFA in Printmaking from Louisiana State University, Baton Rouge, LA in 2010. She currently works and lives in New Orleans where she maintains a studio in her home. Katrina’s work explores the negative effects stereotypes have on people of color. Where stereotypes are typically used to help us normalize our surroundings by categorizing groups of people, the byproduct of stereotypes is that they also create arbitrary differences between people. Stereotyping establishes an arbitrary set of societal norms/rules that benefit the majority while it disenfranchises other groups of people. Katrina’s work challenges stereotypes placed upon people of color (the Other), that once had scientific research qualifying them, and how these ideas or stereotypes have become a part of how we see each other, whether consciously or unconsciously. In her practice, Katrina often creates large scale (4’ or greater), color reduction wood cuts portraying white men in black face, or more recently, watermelon face acting out a stereotype that is most often placed upon people of color. Katrina specifically uses white men as they are typically seen as figures of authority, and are historically the perpetuators of stereotypes against people of color (though people of color often enforce these same stereotypes in their own communities, but it’s not as pervasive, as people of color are more self-aware of these actions most often). Katrina also uses non-people-of-color in her work so the prints aren’t misperceived as being an expression of black culture. The fact that they are sometimes seen as that, speaks to the truth of how well engrained stereotypes against people of color are in our culture. Katrina was listed in the January-February 2012 issue of Art in Print as one of the top 50 printmakers. Katrina is an active member of the Staple Goods Collective in the St. Roch neighborhood of New Orleans. She has also been awarded residencies from the Joan Mitchell Center of New Orleans, Anchor Graphics in Chicago, and Kala Art Institute in Berkeley, California. Cynthia Nourse Thompson is currently Associate Professor and Director of the graduate programs in Book Arts + Printmaking and Studio Arts at University of the Arts in Philadelphia, PA. Previously, Thompson served for twelve years as Professor of Book and Paper Arts at Memphis College of Art and the Chair of the Fine Arts Department. Thompson has also been visiting faculty at University of Georgia’s study abroad program in Cortona, Italy; the prestigious Santa Reparata International School of Art in Florence, Italy; and the University of Arkansas Rome Program in Rome, Italy teaching both papermaking, book arts and printmaking. Thompson was the recipient of the 2003 Tennessee State Arts Commission Fellowship Grant and has been awarded numerous residencies including Yaddo, Columbia College Chicago Center for Book and Paper Arts, Women’s Studio Workshop Book Art Residency, the Visual Studies Workshop Book Art Residency, a residency at the Minnesota Center for Book Arts, a residency at the Atlanta Printmakers Studio, Summer Senior Artist in Residence Book Art and Printmaking Residency at the Oregon College of Art and Craft in Portland, Oregon and most recently a winter letterpress residency at Penland School of Craft. Her work is in the collection of Arkansas State University, the Tennessee State Museum and Dieu Donne Papermill. Thompson received her BFA in Printmaking from the Maryland Institute College of Art and her MFA from Rutgers, the State University of New Jersey. In addition to teaching and curating, previously Thompson worked at Dieu Donne Papermill, Harlan &amp; Weaver Intaglio, Inc. and the Rutgers Center for Innovative Print and Paper, now the Brodsky Center for Innovative Editions.